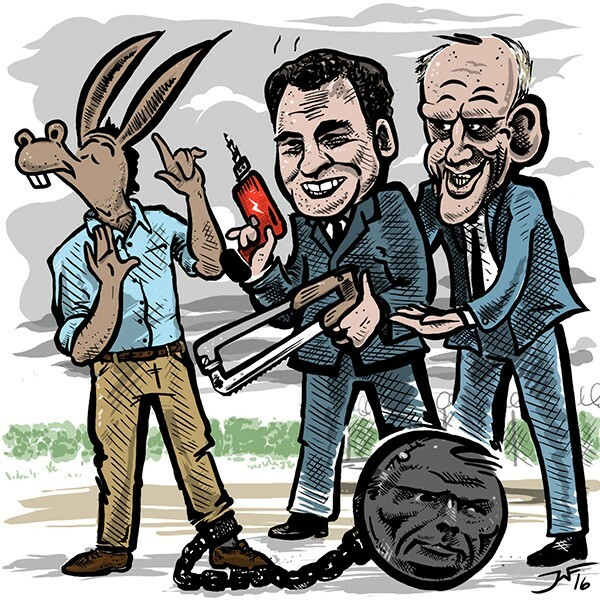 Is Madigan's Democratic opponent a Rauner plant? Jason Gonzales says no, but we follow the money. One day last month, I took a noontime drive to Archer Heights to see who I should vote for in the Democratic primary for the 22nd legislative district: Michael Madigan or Jason Gonzales. Not that I actually get to vote in this election, as I don't live in the 22nd District. 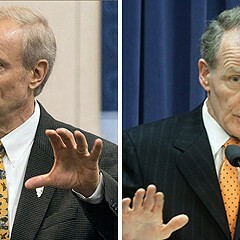 But since in my view the race is basically a proxy battle between governor Bruce Rauner and his arch rival, house speaker Michael Madigan, I figure everyone in Illinois should get a vote. To paraphrase Muhammad Ali, we gonna get it on, 'cause we don't get along. I'm sort of torn on this one. I mean, on one hand, I could write a book about the dastardly deeds of Mr. Madigan, chairman of the state Democratic Party—his strong-arm election tactics, his law firm's efforts to win property tax breaks for the rich (including, by the way, the owners of the building that houses Rauner's old firm), his helping the state run up massive debt, and so forth. On the other hand, he's the goalie—the last line of defense against Rauner's attack on unions, public education, and the overall social safety net. Oh, what's a liberal do-gooder to do? The stakes are especially high as Rauner, having effectively bought control of the state's Republican Party, has now turned his sights on the Democrats. 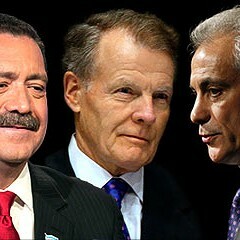 He and his cronies are pouring hundreds of thousands of dollars into Democratic primaries in Chicago. So far their biggest effort has been on the south side, where they've spent roughly $1 million to help Ken Dunkin, the governor's best Democratic friend in the statehouse, against Juliana Stratton, who's backed by Madigan. And what about Gonzales? Is he a front for Rauner too? Let's consider the evidence, starting with his backstory. Gonzales, 42, has never been an active player in the district, which is roughly bordered by Pulaski, Harlem, 55th, and 79th. Yes, his grandparents live there. But he grew up in Elgin and Carpentersville, and attended Barrington High School. When he was 21, he got busted for running up charges on a stolen credit card. "It was a mistake," he told me. "I turned my life around." From community college, he went to Duke and then on to MIT and Harvard's Kennedy School of Government. For years, he worked in real estate, and lived not far from Wrigley Field. Last year, while at Harvard, he had a revelation: he wanted to run for office. And of all the towns or communities he might have run in—Elgin, Carpentersville, Wrigleyville—he chose Archer Heights. At roughly the same time, Rauner needed a candidate—preferably one with a Hispanic name—to run against Madigan in a district that's becoming increasingly Latino. So it's either a cosmic coincidence, or you can understand why some people might be, oh, a little suspicious about his campaign. For his part, Gonzales insists he's not a Rauner plant. "I'm not with Rauner," Gonzales told me when we met at his campaign headquarters last week. So why are you running? "I believe the state's going downhill. We're going to be like Detroit unless we can turn it around." In fact, he says it wasn't Rauner, but Blair Hull, who gave him access to many of his donors. Uh-oh, another name. OK, folks, pay close attention—it's about to get complicated. Blair Hull is the fantastically wealthy trader who spent about $30 million of his own money to run in the 2004 Democratic senatorial primary. (He finished third in that primary, losing to a young state senator named Barack Obama.) You might say Hull was Rauner before Rauner was Rauner—only without the rabid obsession with destroying unions. In January, Hull helped created a PAC called Illinois United for Change, which has collected about $600,000 in donations—$320,000 of which has come from Hull himself. So far the group has dedicated money to one cause: commercials and mailings that either promote Gonzales or denigrate Madigan. Another contributor to Illinois United for Change is the Illinois Opportunity Project, a separate PAC that's headed by Dan Proft, a Republican operative who's also helping fund Dunkin's campaign. Is it just me, or is this starting to sound like a conspiracy in an Oliver Stone movie? Second question: Why is Hull suddenly getting involved in a legislative district that's far from his north-side home? It's not because he's a Rauner fan, Hull says—though he donated $5,000 to Rauner's gubernatorial campaign. To prove his claim, Hull says he hasn't even talked to Rauner since they bumped into each other at former mayor Richard Daley's 2014 Christmas party. 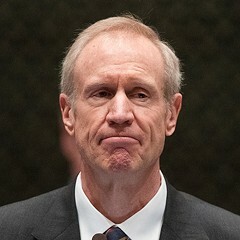 Let's just pause for a moment to picture Rauner and Hull under the mistletoe at Richie's party. Hey, Mr. Mayor—how come I wasn't invited? I asked Hull if he still holds a grudge against Madigan for not backing him in his 2004 senatorial campaign. "I have nothing against Madigan relative to my senatorial campaign," says Hull. "I think he's held back the Democratic Party. And it's time for a change." For the Madigan view, I turned to Steve Brown, the speaker's long-standing press aide. Tell me, Steve, Is Gonzales a Rauner plant? "There's very little evidence to suggest anything other than that," says Brown. "He has no real connection to the community." And what's Hull got against Madigan? "He blames Madigan for him not being Barack Obama," Brown says. "I guess Blair thinks that but for Madigan, Obama would still be a state senator." As Brown points out, this is not the first time Republican donors have helped finance a primary campaign against Madigan. In 2012, Madigan's opponent—a 25-year-old political neophyte named Michele Piszczor—received about $50,000 in donations from Republicans. Madigan won about 76 percent of the vote in that election. I don't think Gonzales will beat Madigan. But if the election's close—or even if Madigan's winning percentage falls slightly from his 2012 results—you can be sure the governor and his backers will be crowing about how even the people in Madigan's home district think it's time for a change. For what it's worth, I spent the better part of an hour at the Gonzales campaign headquarters on South Pulaski, grilling the candidate over his political connections. Me: Raise your right hand and swear you're not a Rauner plant. Gonzales, hand raised: I'm not. In addition, two of his campaign aides—a couple of millennials named Scott Berlin and Ben Gould—also raised their right hands and swore they would never support a candidate backed by Rauner. Well, let's put it this way. If the state wasn't under siege by the Rauner oligarchs, I'd be tempted to vote for a rookie like Gonzales. What happened in Illinois politics while we were all paying attention to the new president. 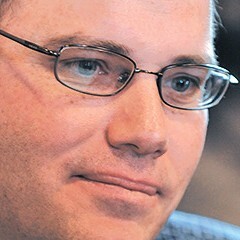 The 13th Ward alderman has run some of the house speaker's most formidable campaigns. The Garcia crowd teamed up with the Madigan bunch in last week's Illinois primary. When the regular Democratic organization picks on an independent candidate, even a small mistake is priceless ammunition. "I Guess I'm the Skunk at the Garden Party"
State rep long shot Claude Walker breaks up what might have been a slick power play.